The Philippine Ice Hockey team finished their first game of the year by taking home the bronze medal at the Challenge Cup of Asia (CCOA). The International Ice Hockey Foundation (IIHF)-sanctioned competition was held at the SM Mall of Asia Ice Skating Rink and marks the country’s first time to host the regional event. Team captain, Steven Fuglister, was named the Most Valuable Player of the tournament with his split 14.5-second goal hit in the Philippines’ last game against Singapore. 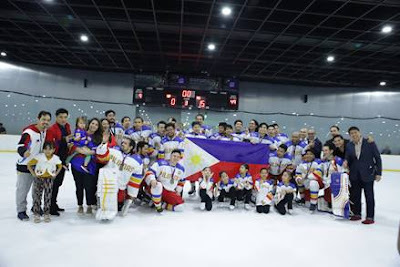 The Philippine Ice Hockey Team, together with their family and friends, celebrate at the close of the Challenge Cup at the SM Mall of Asia Skating Rink. “We want to thank everyone for their great show of support at this year’s Challenge Cup. Our families, friends, and fans gave us an incredible source of strength and motivation during this run, testament to our podium finish,” said Jonathan de Castro, the Philippine Ice Hockey Team’s new coach. The national team will next play at the Philippine Ice Hockey Tournament in June. Although this will not have any direct impact to their IIHF standing, it will further promote the sport as some of the competing teams will come from neighboring countries. The 2019 Southeast Asian (SEA) Games will play a big role towards the team’s overall direction as they look to defend their gold title and advance to the IIHF World Championships. With the Philippines as SEA Games host, the team also looks forward to having the home crowd cheer them on. “We are currently starting preparations for the men’s and potentially the women’s teams for next year. Riding on our motivation from CCOA, the coaching staff is currently breaking down film from our last game to move forward and create the roster for the upcoming 2019 SEA Games,” de Castro added. Future ice hockey games of the national team will be held at SM Skating Mall of Asia, which boasts an Olympic-sized ice skating rink that was unveiled last October 2017. SM Lifestyle Entertainment’s support for figure skating and speed skating alongside ice hockey goes hand-in-hand with SM Group’s vision to help and build homegrown talents. For more updates and announcements on tournaments and events of the Philippine Ice Hockey team, visit SM Skating’s website at www.smskating.com or follow the official social media accounts at @smskating.